Have you ever driven away from your house and found yourself wondering whether you’d remembered to close the garage door? Probably. Have you ever gone back, checked to make sure that the door was closed, driven away, and then had to come back yet again to make doubly sure? And then repeated the entire exercise again? Probably not, but if you have, then you may be one of the millions of people who struggle with obsessive compulsive disorder, or OCD. Jeff Bell is a well-known author, speaker, and radio news anchor. He’s found himself checking the garage door not once, but twice, or three, or more times, on each occasion driving away with less, not more, reassurance about the security of his garage door. He lives with OCD, which is the topic of his latest book, When In Doubt, Make Belief. If at this point you’re thinking, “Well, I may have gone back to to check the garage door, but I’ve never had to do it repeatedly, so I guess this book isn’t for me,” I suggest you think again. Available from: Amazon.com (paperback), Amazon.com (Kindle edition), Amazon.co.uk. When Jeff wrote his first book — an OCD “coming out” memoir, if you will — he was overwhelmed by the interest shown by the public and the media. At first he assumed the interest was due to the “freak factor” — people interested in his bizarre psychological condition — but he soon realized that the fascination was fueled not by the strangeness but by the familiarity of the condition. We all experience irrational doubt. We all experience obsessions and compulsions. At times, each of us has acted irrationally and against our best interests because of fear, anxiety, and other powerful habits that drive our actions. Bell has something to say to each of us. One universal topic he explores is the tendency to see life in black-and-white terms, with everything appearing as part of a dichotomy: good or bad, right or wrong. Who has not fallen into this way of thinking? Bell introduces examples of black-and-white thinking that will resonate with every reader: e.g. someone accuses us of thoughtlessness, and then black and white thought patterns tell us that if one person thinks we are thoughtless, then that must be so, and therefore everyone must think that we are thoughtless, and therefore no one likes us, and therefore we’re going to be unpopular for the rest of our lives. Sound familiar? We may not think like that all the time, but we’ve all thought like that at some point. Bell also discusses, in terms that are very familiar to me as a Buddhist, the difference between healthy (intellect-based) and unhealthy (fear-based) doubt. Intellect-based doubt is founded on reason, logic, and rational investigation, and leads us towards a constructive engagement with our experience, to greater awareness, and to growth and learning. Fear-based doubt is supported by irrational assumptions and black-and-white thinking. Rather than leading to clarity, it causes a spike in anxiety, catastrophic thinking (a never-ending series of “what-if” questions), and leads us to engage in actions that are neither appropriate nor helpful. Ultimately, fear-based doubt is a vicious cycle, where doubt creates and perpetuates itself. Although some of the pathological patterns of OCD are common to us all, Bell takes pains to remind us that OCD is a specific biochemical brain disorder, and not a psychological condition that people slip into and out of. Allow for bigger plans than our own to unfold. For Bell, belief is the opposite of doubt. The 10 strategies outlines above are ways of changing our decision-making from being doubt driven to being belief-driven. It’s important for us to believe in ourselves, to learn to trust, respect, and have compassion for others, and to have faith in life itself. Belief, the way Bell uses the term, seems to encompass what Buddhists would term shraddha (an emotional attitude of confidence and trust) and samyak-drshti (accurate views regarding ourselves and the world we live in). Belief, for Bell, is a choice. It is something we can create (hence the title of the book). The very first step he outlines in “making belief” — choosing to see the universe as friendly — is a conscious choice to see the universe as supporting us to the full extent that we are willing to draw upon it. The universe, then, is seen not as endlessly trying to trip us up, but as an endless series of opportunities for pursuing our own greater good. This is an inherently spiritual outlook, and I believe that any spiritual seeker would benefit from exploring Bell’s plentiful, and hard-won, insights. 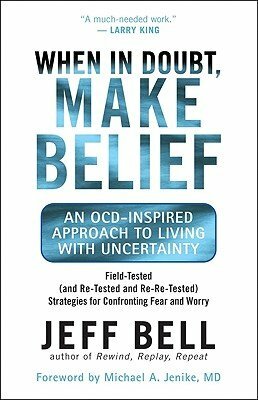 Here’s one more example of Bell’s spiritual insight: “The key to living with uncertainty is learning to embrace the discomfort of uncertainty.” When faced with doubt, many of us panic. Gripped by panic, we grasp after this short term palliatives that promise to relieve us from our doubt but simply perpetuate it. These are what Bell calls “false exits” from the vicious cycle of doubt. This perspective will be familiar to anyone who has read the work of the American Buddhist nun Pema Chödrön, or the existentialist-inspired Buddhist writer, and author of “The Faith to Doubt,” Stephen Batchelor. When In Doubt, Make Belief is a clearly laid out book, full of honest introspection on the part of the author, and bringing in the lived experience of a wide variety of people (some OCD sufferers, some not) as quotations and in the form of interviews with the author. The book contains diagrams neatly summarizing the principles and practical steps that create a belief-based life. Each chapter ends with a handy summary of the main points. For a man who has been crippled by doubt for much of his life, Bell has done a marvelous job of attaining clarity. Bell honestly acknowledges, however, that he is still working with the issues he raises, and that he is not always able to put into practice his own strategies. In fact, he discusses the kind of internal dialogues he has with his doubt — personified as Director Doubt — dialogues in which Bell is forever being accused of being a fraud for not having completely eliminated OCD from his life. In response to this inner bullying, Bell reminds himself (and us) to concentrate on progress rather than perfection. He explains how he assesses each day in terms of how he has demonstrated his passion for life, how he has demonstrated kindness to others, and how he has demonstrated “grace of self.” I can’t help feeling that all of us would benefit immensely from asking ourselves those three questions at the end of each day. Thank you for a clear review. I’m not an OCD sufferer but battle regularly with doubt & uncertainty. I was interested in this book as a compliment to my meditation practice & I’m pleased to see that there is a spiritual perspective in this book.